***UPDATE. Lorenz Gonschor successfully defended his dissertation. He will be graduating in May 2016 with a Ph.D. in political science. His committee members were comprised of Associate Professor Noelani Goodyear–Ka‘ōpua, Committee Chair, Professor John Wilson, Associate Professor Ehito Kimura, Assistant Professor Colin Moore, Professor Niklaus Schweizer, and Assistant Professor Kamana Beamer. According to the Office of Graduate Education at the University of Hawai‘i at Manoa, all doctoral dissertation defenses are open to the public. 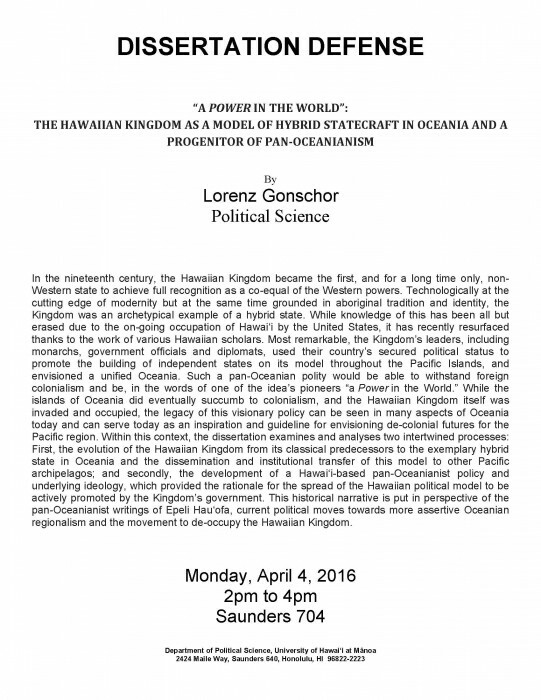 This entry was posted in Education, International Relations, National by Hawaiian Kingdom. Bookmark the permalink. I can not say enough about the works of this great and humble scholar. He will go down in our Hawaiian History as one of the great forensic historians of our time. Mahalo nui loa e Lorenz for being the fine task master that you are. wish I could be there to see you meet this epic challenge. I know you will do well. Aloha Lorenz, imua imua a lanakila! Congratulations on your excellent research and insights. Knowing this information that is coming forward through your efforts and the efforts of your colleagues, I find myself wishing to turn my life’s clock back thirty years or more. May the very essence of “aloha ‘aina” be with you now and throughout your life. Aloha ia O’e Lorenz, I knew from the time I asked you how your “Pacific Travels” (of recent) were, and you just beamed with that ‘I get ’em Bra’ – You “had ’em” Go get ’em Bra! Maika’ Pomaika’i Lorenz! Awue loa! This I gotta know! Go get ’em, brahdda! Congratulations on this well written work. It is an invaluable tool to help to explain the state of affairs in Hawaii today. Your writings will make it easier to educate my students (who live on the East Coast) about the Kingdom. Good luck to you on April 4th. I will be sending you my best wishes. I look forward to reading your published work. This brings much hope that we will see our Hawai’i become the Kingdom we could actually live by. I look forward to reading more writings in the future in order to be updated on what is legal and moving forward in that manner. My mother shared with me that the parallels between the U.S. occupation of Hawai’i and the former Soviet occupation of Lithuania are being studied in terms of peaceful resolution. I look forward to reading your dissertation in full. Mahalo! You have my support today! Lorenz Gonschor another vital scholar to help educate us all. Mahalo for all your supportive comments. I appreciate them very much.